Ecoideas Cacao is organically grown on an Ecuadorian farm where farmers and workers are paid fair wages. You can truly enjoy your cacao knowing that their entire cacao line is certified fair trade by Fair For Life. Try making your own cacao butter or chocolate from scratch! 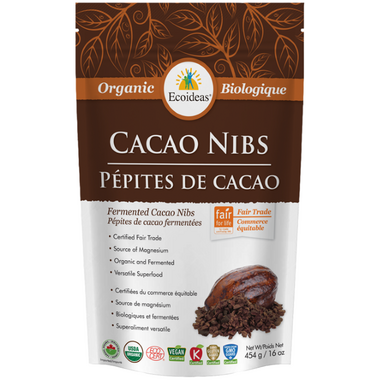 Also makes a great cacao tea or cacao hot chocolate and works great with baking. I put these in my smoothies and with yogurt. Love it! Not a lot of sugar, perfect to make my owned bars, it gives them a crunchy side. I am happy with the price and the quality of this product.